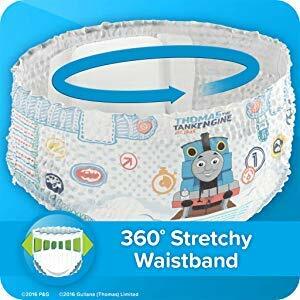 Home / Toddler / Potty Training / What Are The Best Potty Training Pants In 2018? Congratulations! You’re half way there. When your child graduates from diaper to potty training pants, then it’s no doubt that you’re doing a good job with the potty training task, and in few months, the whole training becomes a history. Shopping for the right potty training pants is however not as easy as it sounds. If you end up buying the wrong pants, your child might relapse and the training success rate might drop significantly. Not only that, a bad pant might leave them with rashes. Having potty trained three kids, training pants is something I find very valuable when it’s time to move to the next stage of the training, and here is my advice on getting the best potty training pants for your child. Absorbency: If the training pants does not have a good absorbency rate then it’s no good. Generally, you want to go for a product that will absorb the urine all through the night. Comfort: It must fit nicely and to some extent be comfortable on the child. Often are times when people end up buying the wrong size for their kids. It should leave enough room for breathing space. This is very important. It should also not be saggy, hence you end up cleaning the sheet every day due to leakage. Leak protection: The major difference between a diaper and training pants is this; a diaper would protect the child from the discomfort that comes from peeing on their body, and also protect the environment; the bed or wherever they are from getting soaked with the pee or stained with poo. A training pant on the other hand protects the environment from getting soaked or stained, but it makes the child feel uncomfortable when they pee in it. If a pant cannot prevent leakage, then it has failed to serve its primary purpose. This is something you should look out for when making purchase. Easy to wear and pull off: Training pants are great for daytime outing during potty training as well as for bed time training. If you’ve gone past day-time accidents, having a pant that is difficult to pull off might result into accident; and this wouldn’t be the fault of the child. The pant of your choice must be relatively easy to wear and pull off. Materials: Generally; babies’ skins are really sensitive. You want to keep an eye on the material from which the pant is made of. You always want to be very sure it does not contain chemicals that will leave your child with rashes. Because it is usually close to their skin. And the tendency of heat brewing up in that areas is very high, if the pant has high chemical component; then it is bound to react with your child’s skin. Chlorine amidst several other chemicals are what you want to look out for. You also want to know if it’s made of TPU (thermoplastic polyurethane) or PVC (Polyvinyl chloride) which is something you want to protect your kid from. Stage Of training: The stage of potty training also determines the type of training pants to get. If you’re in the bedtime training stage; which is usually the last stage; you might want to get one of the cloth trainers with plastic cover. They prevent leak from overnight accidents, and most importantly, they remind your child of the discomfort that comes with peeing in their pant; so they tend to learn really quick. This is the closest to a real underwear on this list. When you’re at the stage of using training pants during daytime, you want to go for something that is close to ordinary underwear as much as possible. The potty training pant comes is different colorful design that your child would find very attractive, and won’t have any problem slipping into any of them, in some cases it would motivate them to not stain it, because they consider it a precious apparel, they wouldn’t want to soil it, hence they reach for the potty as soon as they get the sensation to pee or poo. Reusable: They’re washable. Using disposable pants during daytime might be expensive if you have kids that haven’t been fully trained. 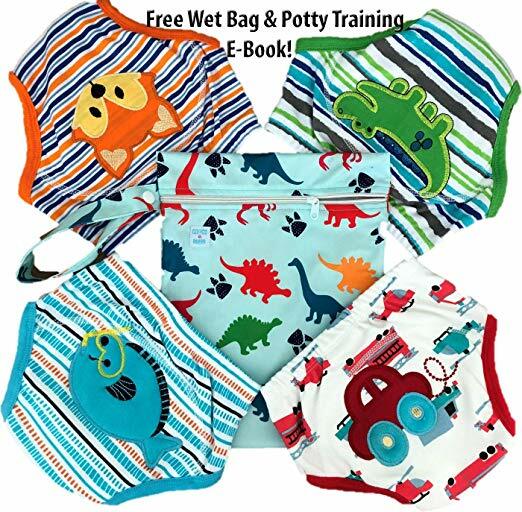 The Mom & Bab potty training pants is reasonable priced, and you don’t have to throw if in the diaper pail when it gets soiled; it cleans easily, all you have to do is wash like regular fabrics and it’s ready for use again. Water Resistant: It’s not too absorbent, holds enough urine to prevent it from dripping down the child’s thigh, while also giving them the feeling of discomfort. This is really important for effective potty training. If the underwear absorbs quite well, then the message of cause and effect would be missing for the child. This pant hold reasonable amount of pee, up to 30ml is specified by the manufacturer. Material: It’s made of very comfortable soft cotton, the waist band is elastic and leg hole is perfectly sized, tight enough to preventing leaking when accident occurs, yet comfortable enough for the child. It thus contained mess properly. Although made of cotton, the part that serves for water-resistance is made of TPU (thermoplastic polyurethane), this is safer than the PVC. Design: The stitch and fabrics is excellent, the water proof part is perfectly placed between the interior and exterior cotton, and as such does not come in direct contact with the child’s groin region. The water resistance part is also not “bulky”, which is a bonus, as it gives the child a sense of “maturity” because it looks just like “big-boy” underpants. This training pant is mostly perfect for day time use; if you child is yet to master the night training; then you need to get a more absorbent pant for the bedtime. The only downside is the issue of size. You have to measure your child thigh and compare it with the manufacturer’s size chart before making purchase, lest you end up with the wrong size. The supplier advice that you wash, and heat dry to attain the desired size after purchase. They have a very supportive customer service, if you end up buying the wrong size, they are super supportive to help fix the problem. Most diapers and disposable training pants will leave your child with skin rashes if they happen to have sensitive skins. You generally want to stay away from pants that will complicate the issue for them. If your child happens to fall into the category of people with very sensitive skin, then this is the right training pants to get them. It’s completely made of naturally sourced materials, no chemical, no perfume, no substances that could put your child’s skin at the risk of reaction. Absorbency: For training pants; you want them to absorb enough content to not stain the cloth and the immediate environment, but also keep the baby body wet, so as to make them feel uncomfortable a little bit. This training pant absorbs a lot. It could almost pass for a diaper if you probably run out of diaper unexpectedly. This is to show how much they can hold up. In a way, this is a good thing; especially for heavy bed wetter to use at night. But if your intention is to quickly get your child to understand cause and effect as far as potty training is concerned; then you should not use this pants for daytime training. They will serve you best if you use them at night, because of their high absorbency rate as compared to other disposable training pants. Design: Since it is not re-usable, it is designed in such a way that, once you put it on, you cannot carefully remove it to use again. Some disposable training pants usually have a sticky tab on both sides that allow easy removal and reclose; this product does not have that. Another win as regards design is the attention given to comfort. It’s not bulky as you would expect of a disposable training pants. Your child would see little to know difference between this and a regular big boy pants. As with the waist “band” it is designed to be a slightly stretchable at the waist so as to fit properly. The leg hole snuggles perfectly, tight enough to prevent waste leakage, and the pant itself has enough room for air, making it breathable. This is an important feature so as to avoid unwanted heat that usually results into skin rashes. Material: It’s important to know what the product you intend to use is made of. 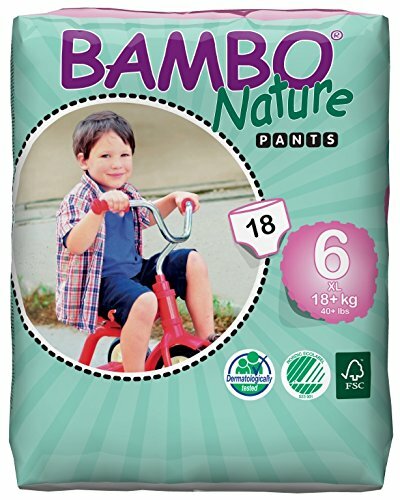 The extremely soft material that is used in making this pants is from timber, the pant does not contain any form of chlorine, or dye, perfume or lotion that may react with the child’s skin. The choice of material does not make it the best training pant for sensitive skin, it also makes it one of the most comfortable potty trainining pants. As good as the training pant is; it might give your child the idea that they’re back into diapers because they absorb too well. I strongly suggest that you use them for night training and long outdoor trip. While stick to cloth training pants during the day. Starting potty training at an early stage might be beneficial, but the struggle of getting the appropriate training pant size is real. The Gerber little boys’ training pant is one of the few products that caters for kids as young as 18 months of age. Made of cotton to provide soft and comfortable feeling on the skin. Unlike most cloth training pants, it does not have a plastic liner in-between it layer. Normally, cloth training pants will have a plastic liner to serve as water proof. This is beneficial as you don’t have to worry about whether the liner is made of PVC or TPU. This product is just thicker in the crotch area to absorb minor accidents and not a major one. Designed to be reusable as it is made of washable cotton, you get to use them over as long as washing isn’t an issue for you. They don’t slack or fade in design following wash. Because color and design is one of the things kids like about their underwear, you’d want to get something that won’t fade off after couple of washes. The design on this one does not fade off. It’s also very easy to wash, and can be washed alongside other cloth materials. The problem with most pull up or disposable training pants is that; they’re either too difficult to pull down by the kids, or they absorb a little too much, which isn’t a good thing when you’re indoor trying to potty train. This product pulls down easily, and older kids don’t need parent’s help in getting it down and up again. Once they’re fairly trained, then they’re good to go as soon as they get the sensation of using the toilet. The training pant is perfect for minor accidents and it fits quite well, once you get the appropriate size based on your child’s weight and age. It shrinks a little bit when you wash in hot water or dry in a dryer. You should keep that in mind while making purchase decision. Aside having beautiful colors that kids love, the other advantage of it being colored is that; they don’t stain easily. If your child should have a minor accident; first or second, simple washing will get it back to being close to new. This isn’t usually the case when you have a white or lighter colors. They’re not perfect for night time training. Especially if your child is just transitioning. They will get your bed wet if you use them for night training, also you shouldn’t use them for long distant trip as they can’t hold much. If you’ve noticed that your child’s skin is very sensitive and react to chemicals, then this is not the right training pants, as it has a lot of chemicals in the materials. Basically, they used polypropylene for absorbing the mess, and also colorants for printing on the pants. If skin sensitivity is not an issue, then you should consider this product, if you intend to achieve maximum absorption of the mess. A friend compared this product to the regular diapers, only difference being that, it opens up on the side easily, and it’s designed in the form of an underwear. This is to show how much they’re capable of holding up when accidents happens; either number one or number two. The side Velcro allows reuse. Probably when you check to ensure there is no accident; as compared to bambo nature premium training pants that cannot be reclosed when opened; then can be closed again, if there is no need to change the pants. It’s also very easy to wear and pull off by the kid, this is important as it gives them a sense of independence of being able to do it all by themselves when they need to use the potty. The design for both boys and girls are very similar, except for the Disney Pixar on the body and the extent to which the absorbent in the crotch area covers; for boys it extends a little bit higher than girls. No matter how good the material is, if it doesn’t fit, then it’s no use, as the absorbent won’t be at the right place where it is needed. This product fits perfectly on the child, as long as you do your homework in selecting the appropriate size for your child. The Disney Pixar is good for encouraging kids to use the pants, as a way of educating the kid, it also fades off when they pant gets wet. This serve two purposes; it serve as an indication for the parent to know when there is a need for change of pant, also once the kid gets used to it, they usually don’t want the Pixar to fade off, so they try as much as possible not to wet the pant by letting you know when they want to use the potty, rather than peeing in their pants. 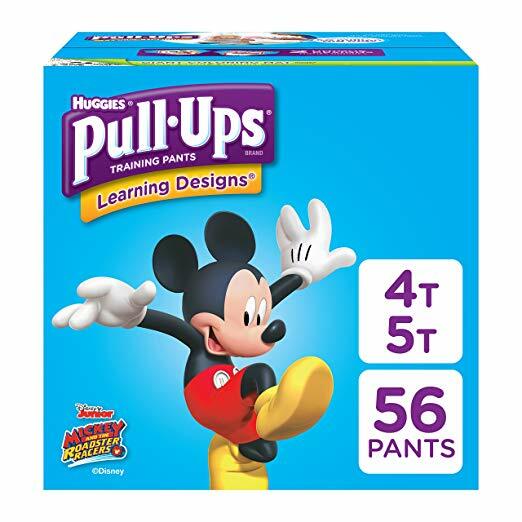 Pull-up is perfect for night time potty training, especially if you have kids that are heavy wetter. Some parents have also had success using in place of diapers. This is to show that, it does not really do much when it comes to the education of cause and effect. If however, you have a child that has been well trained for potty training, and you intend to go on a long trip, this can come in handy for cases of accidents. It is also the best product for parents with older kids that has special need. You want to get them off diapers and use this underwear like training pants until they are able to master the process of using the potty. The manufacturer states that the product is designed specifically for night time training. It does a good job in preventing leaks when they happen, and it has great absorbency like you would expect from a good disposable training pant. This product comes in sizes large enough to fit older kids. This can be very beneficial for two major reasons; if you have a child that has been fully potty trained for the day and they’re still struggling with night training, then this comes very handy. It’s also the best recommendation if you have older kids that the regular diapers no longer fit, but they’re yet to get potty trained fully, either during the day or at night. 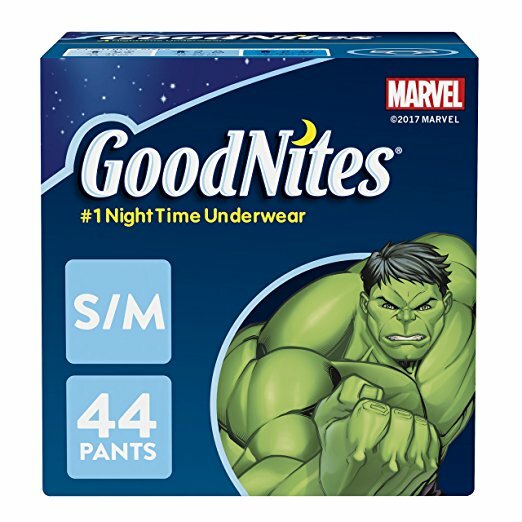 The Goodnites Bedtime underwear can be the solution. They work like a regular diapers will, yet not as bulky as a regular diaper. This is advantageous for older kids that need to use the training pants during the day. It fits nicely under jean and nobody knows they’re on training pants. The materials used in the production of this product is similar to that of pull-ups, polypropylene is heavy used. It’s equally super comfortable on the skin. The added benefit comes from the additional absorbency since it is designed to stay on all night. It’s also designed to absorb odor. Which is a plus when it comes to discretion. It’s easy to remove for the kids. As a training pant, once your child can wake up by themselves during the night, then you need a pant like this that allow them to get the business done and go back to bed. The iron man design on the male version is a good hook to get kids to love the idea of wearing the training pants. Child loves it when they see a character they can relate to. This product comes highly recommended for parents with older kids, or child that is yet to get a grip of the night potty training. Sizing is very important as well, if you end up buying the wrong size, you might be left with leaking pants, so do your homework in choosing the best size for your child. Of all the cloth training pants that has been recommended so far; this is the best when it comes to absorbency. They have very thick pad at the crotch area. In comparison, the padding is thicker than the Gerber previously reviewed. Thick enough to absorb a single accident without any issue of leakage, yet not bulky as you would expect of a pant which such absorbent rate. They fit perfectly, snugly nicely at the thigh, which is where most people have issues when it comes to getting the right pair of training pants. This particular product does not leave space in the thigh hole, thus providing no room for poop or pee to escape in cases of accidents. Made mostly of cotton, making it soft, comfortable and durable. It’s easy to pull off for the kids, since they’re designed exactly like a regular underwear, the only difference is the presence of a padding in the crotch. It comes in different patterns, this design has an advantage because kids would eventually get used to them over time, and they would want to have it on for as long as they could, they would also try not to stain it. Keeping them at alert to go use the potty rather than wetting the pants. Although the pad and the waist band is made of spandex, it’s completely covered with cotton to avoid direct contact with the skin. Washing is very easy, you can easy threat like a regular fabrics, sun dry or use dryer. It also does not slack off after several washing which means you get to use them for as long as you want, at least until you child is grown enough to do away with them. On the cost end, this is a very good buy when compared to disposable pants. This product is highly recommended if you have a kid that is transitioning from diapers to real underwear. It might be difficult to do the transitioning directly, so using a product that is in-between the two is highly recommended. Some of the negative reviews of the product can be attributed to the buyers not knowing what they want. There is a huge difference between pull ups (disposable training pants) and cloth training pants. And no matter how good the design of a cloth training pant is, they cannot absorb as much as a disposable training pant will. If your preference is a training pants that can absorb as much as possible, then you are better off going for disposables. If on the other hand, your preference is with the cause and effect; then go for this product. Pampers is a very reputable brand when it comes to production of diapers. I have a friend that calls diapers “pampers”, she has completely traded the brand name for the entire diaper products. It’s had to go wrong with the brand’s product as they’ve been around for a very long time, and they know exactly what parents wants after several market research. The easy up training underwear is designed to absorb like a regular diaper and also fit like a regular underwear. It might not be the first choice if you have a kid that is fairly potty trained. But if you’re just commencing potty training, this is the best choice of product. They are not bulky (as expected) and can be easily worn under cloth without having the feeling of being in a diaper. The product has two version, the new version and the old version, there isn’t much of a difference between the two, just the waist band. In the new version, the entire waist band is elastic, while in the old version only the sides is elastic. Most people prefer the new version because it does not leave mark (band imprint) on the child’s body. Both version can be easily torn on the side when there is a need for changing it, but they do not have the common Velcro like other disposable training pants. This makes it important that you confirm the pant is wet before changing it, because once its torn, you cannot reclose again. If you’re tire of changing sheets due to heavy bedwetting from kids that are yet to get a hang of night potty training, then this is the appropriate product to go for. It might not be a good option if you have a fairly potty trained child that needs to get the message of cause and effect really fast. Because they end up feeling comfortable in this like they would in a normal diaper. It’s important that you know what you want, this will go a long way in avoiding unnecessary expenditure on products that would not serve your purpose. Checking through the cost, they are almost in the same range, although the cloth training pant would be much more cost effective in the long run, since they’re reusable. Next ArticleBest Bottles For Breastfeeding Babies: Detailed Review.